RACINE, Wis. – Aug. 6, 2018 – Twin Disc, Inc. (NASDAQ: TWIN), a global leader in power transmission technology for marine and land-based applications, unveiled the Twin Disc Heritage Gallery on Aug. 2, at the company’s Racine headquarters, in celebration of its 100th anniversary. 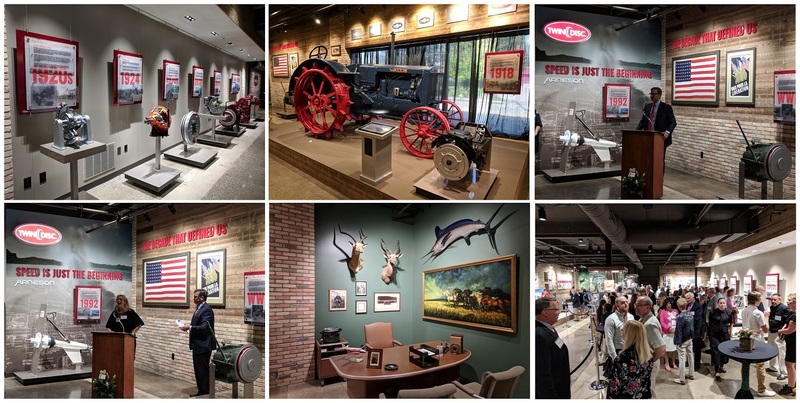 The gallery, which takes up roughly 4,000 square feet of the first floor of the Twin Disc corporate headquarters, provides visitors a chance to see how integral Twin Disc has been, both for Racine and the U.S., as well as the world, over the past 100 years. Twin Disc products, from the first marine transmission prototype to the E-Type flywheel clutch and Power-Shift Transmission, are on display, along with progressing generations of Twin Disc’s machine parts over the company’s 100-year history. Also on display at the gallery are a variety of Twin Disc memorabilia, including the first meeting minutes between the company’s founders, original stock certificates, and a Wallis tractor equipped with a Twin Disc farm factory clutches, which was the original product that helped launch Twin Disc in 1918. The gallery’s most distinguished feature is a section dedicated to the decade that defines the very backbone of Twin Disc throughout its 100-year history, the lead into World War II, when Twin Disc was asked to design a marine transmission for the Higgins Landing Craft that would be used throughout the South Pacific and the D-Day invasion. More than 40,000 landing crafts (or LCVPs) served U.S. troops during the war, and most did not come back. They were either destroyed in conflict or left in theatre, eventually to become fishing boats, work boats and water taxis. Because those vessels were in use and needed to be serviced, the little company from Racine now had customers around the world, which introduced Twin Disc to lifelong partners in Europe, Asia and Australia. At the event, Racine Mayor Cory Mason and Racine County Executive Jonathan Delagrave declared Aug. 2, 2018, Twin Disc Day in both the City of Racine and Racine County. The Heritage Gallery will be open to the general public by appointment only in the fall, and will also feature a flex space for special exhibits, educational programs and receptions. Twin Disc, Inc. designs, manufactures and sells marine and heavy-duty, off-highway power transmission equipment. Products offered include: marine transmissions, surface drives, propellers and boat management systems, as well as power-shift transmissions, hydraulic torque converters, power take-offs, industrial clutches and control systems. The Company sells its products to customers primarily in the pleasure craft, commercial and military marine markets, as well as in the energy and natural resources, government and industrial markets. The Company’s worldwide sales to both domestic and foreign customers are transacted through a direct sales force and a distributor network. For more information, please visit www.twindisc.com.